When I first got this product I was a little hesitant, most products like this are oily and usually leave me red. This product did not do that. It did not give me that familiar feeling of being greasy and it also did not irritate my skin. 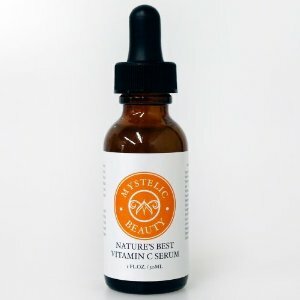 Mystelic is a very pure Vitamin C serum, it is actually 18 percent pure organic vitamin C. It can be used for acne, eye serum, and all over your face. I also like that it was packaged in an amber glass bottle with a glass dropper so I know there is nothing from plastics leaching into the serum. I noticed that after using it a couple of times the fine lines on my forehead did feel smoother and less indented. The deeper wrinkles took about a week to feel and look better. I did like that I could use this and my own moisturizer without my skin developing a shiny appearance. Sometimes anything you put on for wrinkles and fine lines is just a very heavy moisturizer and it is too heavy. This went on light and delicately and felt nice. My skin was left feeling smooth and elastic and it helped with dryness as well. I can’t wait to see how this works in the long run! I think it has great promise to be one of those things that nobody should be without. I think you should give it a try and see if it can help your skin. It has helped mine and with no irritations, which is always very important to me with sensitive skin.